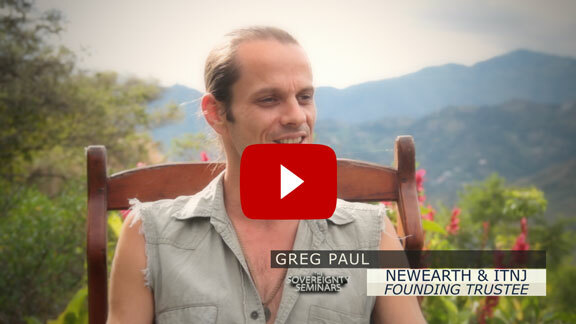 This is the last reminder to join the first Sovereignty Seminar presented by NewEarth founding trustee Greg Paul. The time of the great divide is here – each of us feel the cracks widen each day. What realities await us are determined by how we actually show up, and the Truthfulness of the choices we make and actions we take. Nothing less and nothing more. So how do we manifest a sovereign existence - how do we step out of the visible and invisible prisons we have agreed to reside within? We come together and look reality squarely in the eyes; and we evolve individually by choosing to experience ourselves as response-able for where we stand. Will you continue along the path well-trodden, or find the courage to ride the road not taken which calls longingly to each of us? It is time to declare ourselves – we are ready now. No more talk, no more resistance. Greg Paul is a young man who has the courage to live the Truth as he perceives it. His passion is to embody the Truth that sets all of us free. This passion, heart and strength are a true inspiration. Greg has the courage to step into himself, each moment, regardless of the cost – something we all must learn to do. Beyond right or wrong, beyond good and bad, he and those who join ranks in the awakening community are at the fork in the road. Which choice will you make? Would you like support to transcend wounds, limiting beliefs and massive interference to chart your course with the Planet herself and live your own unique sovereign destiny? Would you like the tools to ground this sovereign ethic in your life and relationships? If so, don't miss Greg Paul and this first Sovereignty Seminar. We will be gathering with like-minded/hearted people from around the world, united by the call to collectively step up to embody our authentic sovereign expression.